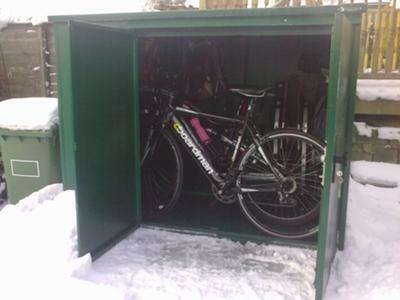 Metal bike shed in my garden - In the Snow! Really good shed. Lots of screws in the pack, so an electric screw driver is a must. The unit is very heavy as it is made from rust proof steel. Took me and a friend about 35mins to put together. Instructions were very clear, the shed was delivered on time and complete. Very strong looking unit excellent 3 point locking system (built in pick proof lock) Angled roof keeps the rain under control - The whole unit can be bolted to the floor for even more security - but with the weight of this thing, I can't see it getting nicked. Double door front with lock and as a bonus you can change the handing of the door. 10/10 really can't fault it. Return to metal shed reviews. This is my 1st ever product review, so I hope this is of interest. Delivery was not the quickest at 2 weeks – Though I was told this at the time of order – these are all made to order with little stock kept in the factory. But I have to admit when it did arrive I was impressed by the Asgard delivery guys, who went out of their way to place the shed pieces around the back of the house for me. What stunned me was there was no packaging, each section of the shed was individually wrapped in blankets. I liked this as I am a keen environmentalist and I like to reduce my carbon footprint as much as I can, no packaging equals no waste. 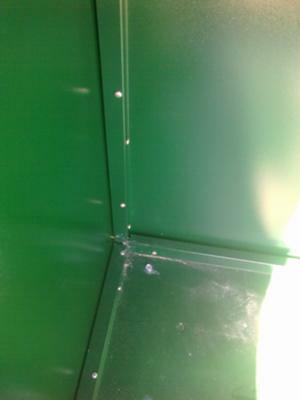 The supplied instructions were very easy to follow (lots of pictures) – there are a lot of screws in these sheds, so an electric screw driver is essential. The entire unit is built inside out – this sounds weird, but basically means all the fixings are inside so no screws are shown externally. Basically you stand inside and put it together. This is a heavy product – obviously made from very heavy gauge steel (thick) so it is a 2 man job to assemble. Do not try this on your own, the roof will fall and you will hurt your foot! There are vents on the front and hidden in the roof eves to reduce condensation and to be honest I was sceptical about these at first but they have done the job (so far). All is dry inside after 3 months of the usual British summer time. The area in which this excels is the locking system. Never have I seen such a good lock on a humble garden shed. This is a drill proof lock I would normally expect to find on an industrial lock up. Very impressed, also I got three keys rather than the normal two. Top marks here. 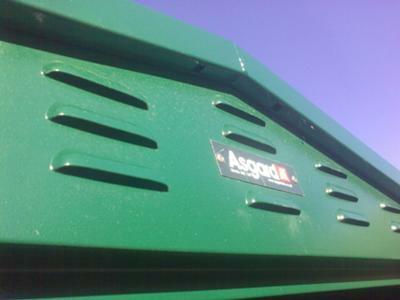 A word of warning – all over the website Asgard specify you need a level base to sit the shed on. This is a must, if your ground isn’t flat the shed will not close smoothly (levelling kit is supplied for adjustments up to around 15 mm). But make life easy and get the ground flat. My one criticism is that the hooks pack is extra -It would have been nice to get hooks free for what they are - a bit of bent metal! All in all very impressed and worth the money overall.